Have you ever watched someone make a pretzel? 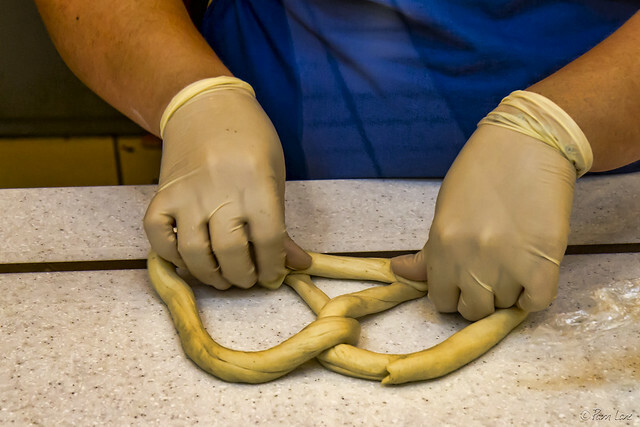 These hands belong to Lourdes, who is making pretzels at Wetzel's Pretzels at Stonewood Center. It's fun to watch. First, Lourdes cuts off a line of dough, then rolls it out. (It made me think of playing with Play-Doh.) Next, she picks up both ends and flings them around in some kind of fancy movement that was too fast for me to follow (or catch on camera). At the end of that motion, it lands, magically pretzel-shaped, on the counter. She sticks the ends together, and voila, there's a pretzel, ready for the oven.